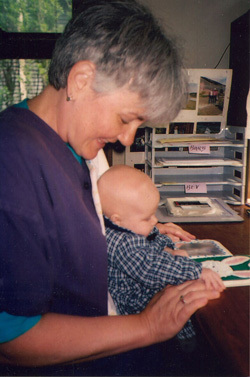 "I am a registered nurse and prior to starting with in vitro fertilization (IVF), I did a lot of reading about pregnancy and IVF. From the Mayo website, I learned from the latest research that IVF has a higher pregnancy rate when combined with acupuncture than when done alone. Dr. Mudrak timed acupuncture treatments around the dates of my hormone therapy and the embryo transfer, and well, I guess the acupuncture really did help—my husband and I can count our blessing every day. I have recommended Dr. Mudrak to those couples with fertility issues who are also going down that stressful path of 'baby-making.'" If you are choosing IVF as your primary reproductive therapy, one acupuncture session before and one after an IVF procedure enhances the rate of pregnancy by 35% as documented by the study at the Mayo Clinic. More information on the success acupuncture enhancing the outcomes of IVF and ART are documented in Dr. Lifang Liang's book Acupuncture & IVF, which finds that IVF pregnancy rate is increased by 40-60% utilizing Chinese herbal medicine and acupuncture as a course of treatment over weeks or months. 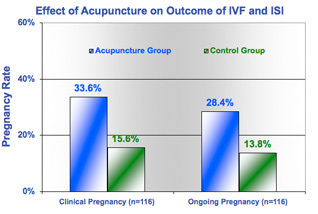 The conclusion is that a course of combined therapies of acupuncture and Chinese herbal treatment significantly increases the rate of pregnancy beyond the rates seen in single acupuncture treatments with IVF or IVF alone. Multiple research studies are documented in summary form and illustrated by graphs in the Resources section of this website. As a member of the American Society of Reproductive Medicine (ASRM), Dr. Mudrak highly encourages Single Embryo Transfer (SET) for enhanced health and safety of the mother and fetus, lower miscarriage rates and fewer birth defects. When coupled with acupuncture, SET will most likely have a higher rate of pregnacy than multiple implantation done without acupuncture. This information, researched and published by the ASRM in their Fertility and Sterility journal, is located in the News section of this website for your convenience. The relative costs of IVF are also summarized in the News section of this website. It has also been researched and published by the ASRM in their journal Fertility and Sterility and noted below. According to the ASRM Journal Fertility and Sterility (13:11), March, 2011, Researchers at the University of California San Francisco published the results of a study involving 398 women treated at eight reproductive endocrinology clinics in California. About 20% of participants pursued non-cycle based treatments such as surgery or tests. Cycle-based treatments pursued by the remainder (80%) included: medication only, intrauterine insemination with clomiphen citrate (IUI-CC), intrauterine insemination with follicle stimulating hormone (IUI-FSH), IVF and IVF with donor eggs (IVF-DE). Treatment was successful for approximately 30% of patients overall, while 46% of women who pursued cycle-based treatment achieved pregnancy or delivery withn the study's time period.